Recently, we discussed the Varigate 8+ from Malekko which, when paired with its sister module Voltage Block, become one of the most powerful sequencing engines in Eurorack. But the Voltage Block is an essential tool, offering 8 independent sequencers of up to 16 steps, with clock division, direction, step glide, scaling and more per channel. For semi-modular owners considering deeper investment into Eurorack modules, Voltage Block is the perfect compliment for modules like the Mother 32 or 0-Coast (which I used in this video). 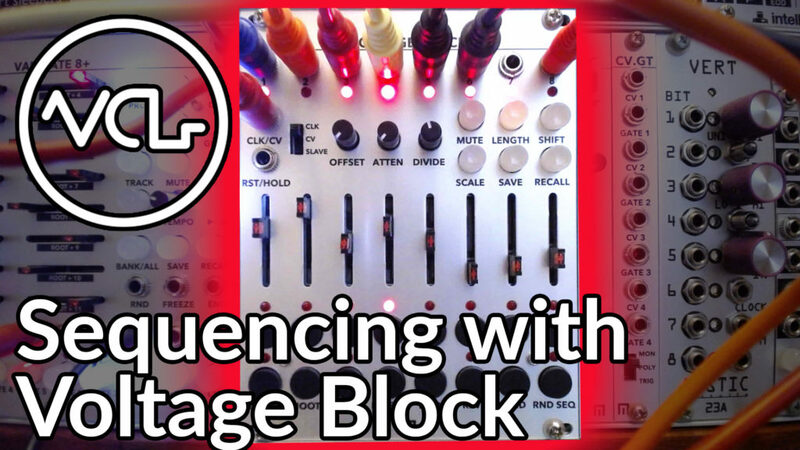 Sequences can be composed in a few different ways on the Voltage Block. One method is to simply move a channel slider up and down while the module is receiving a clock. The motion will be recorded on each step as it passes, repeating back as the sequence loops. This is particularly useful if you are using your sequencer as a CV modulation source, though you can discover some really interesting musical patterns this way as well. Another way to sequence patterns is to hold a step button and move the slider to the desired voltage for that step. Follow this process through the steps, and you’ll have a more exact pattern than is achievable through the live sequence recording with the slider. Randomizing sequences can also be a great deal of fun, simply enable Shift mode and hit the RND button to generate random sequences. By selecting one of the 8 channel buttons in the first row of step buttons, the randomization can be limited to only one sequence. The scale tool can be handy if you are using the Voltage Block to sequence melodic parts, constraining the sequence voltages to musical divisions of each volt. Enable the Scale mode, and use the channel slider to select one of the 16 scales and modes available. We’ll have more with the Voltage Block in coming weeks… We also have some huge news coming very soon! Subscribe to our email list for more details!